Check this page regularly for the most current event schedule. The 2019 Workshops and Online Course schedule has not yet been published. 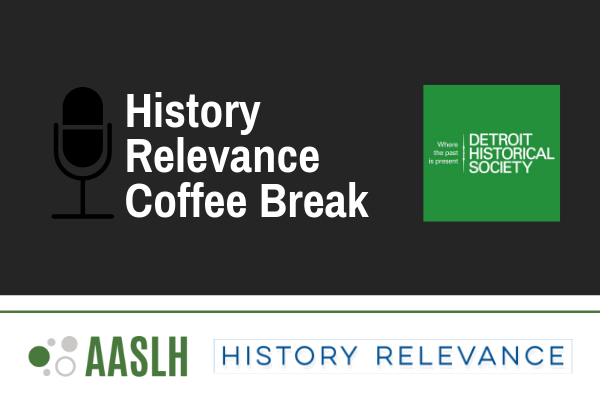 Writing for History Publications is an AASLH Continuing Education online event on May 30, 2019. This live webinar is about how you can become a resource for the field by writing and sharing your public history work. This webinar is presented by Sarah Handley-Cousins, Sarah Case, Nicole Belolan, John Marks, and Aja Bain. Strategic Planning: Aligning the Work of Your Organization is an AASLH continuing education event presented by speaker Dani Robbins on May 31, 2019. This webinar demonstrates how strategic planning can help your organization be stronger, your board more engaged, and your work more intentional. 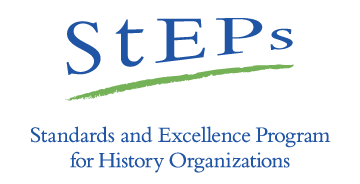 This webinar is part of the StEPs Lab series of online continuing education offered to both StEPs program participants and all others interested in strategic planning. This is StEPs Lab 18. Exhibit Makeovers is an AASLH on-site workshop on April 29-30, 2019 at History Colorado, Denver, CO. This on-site workshop is about learning the basics and experimenting with creative history exhibit planning and design. This workshop is presented by Ann Craig. 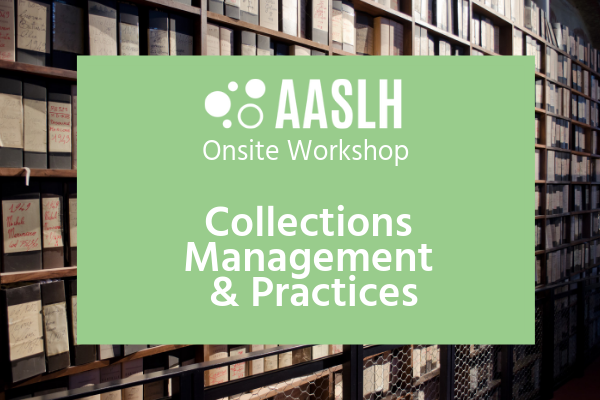 Collections Management and Practices is an AASLH Continuing Education on-site workshop on June 3-4, 2019 at The Charleston Museum, Charleston, SC. This workshop is taught by Samantha Forsko and John E. Simmons. Focusing on Visitors: Public Programming and Exhibits at History Institutions is an AASLH onsite workshop on June 17-18, 2019 at Minnesota History Center in St. Paul, Minnesota. This in-person training keeps visitors and active learning as a focus in an overview of public programming and exhibits. This workshop is taught by Tim Grove and Alexandra Rasic. Creating Programs for Teachers and Students (formerly Connecting Your Collections to Teachers and Students) is an AASLH Continuing Education workshop on June 24-25, 2019 at The Bullock Museum, Austin, TX. This in-person workshop is about the elements of museum education and programming needed to create educational programming for students and teachers. This workshop is taught by Stacia Kuceyeski and Megan Wood. 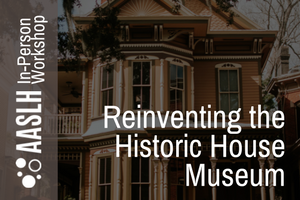 DUMBARTON HOUSE, WASHINGTON, D.C. | JUNE 28, 2019 @ 8:30 am - 5:00 pm | Reinventing the Historic House Museum is a one-day symposium designed to offer current thinking, practical information, and solutions to the challenges facing historic sites. The symposium will include presentations by historic house game-changers and local historic site administrators, discussion, a boxed lunch, historic site visit, and a brainstorming workshop at a historic house museum to try out the new ideas proposed during the symposium. 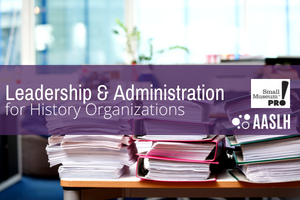 Leadership and Administration for History Organizations is an AASLH Continuing Education online course on July 1 - August 23, 2019. This online course is about history museum leadership. This online course is taught by Anne Ackerson. Basics of Archives is an AASLH Continuing Education online course September 30 - October 25, 2019 hosted in the online classroom. This online course is about caring for historical records. This online course is taught by Charles Arp. 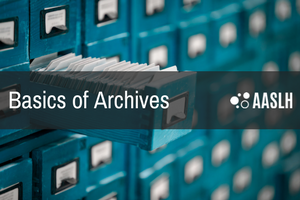 The recently revised Basics of Archives online course is designed to give organizations and individuals who are responsible for the care of historical records an introduction to the core aspects of managing and protecting historical records collections, using appropriate principles and best practices. 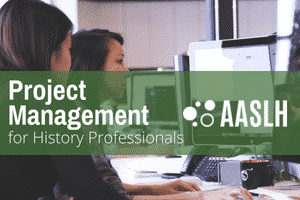 This AASLH online course shows you how to implement internationally recognized project management principles in a history/nonprofit context.